I haven't done an empties post for so long due to all the guest posts whilst I was recovering but my empties box was overflowing from all the empties I had collected over the past 3 months. To do a post on them all would be epic and nonsense so I decided to do a round up post on the 'best of the best' empties, focusing on the ones I loved and will definitely be repurchasing. Everything I have tried so far from Elemental Herbology I have loved so much and the Facial Detox mask was no exception. This is an old school white clay mask with extracts of malachite, laolin and manuka honey. I found this amazing for stopping spots in their tracks and making them recede back to nothing. You apply the mask to dry skin and it dries down to a pale grey clay and some of the mask is absorbed by the skin. It does harden but it's relatively easy to remove with water and a damp flannel. Possibly my favourite exfoliating toner of all time, I just love how the runny gel like texture feels on the skin. This is a very gentle exfoliating toner and perfect for those new to the concept. It contains tamarind fruit acids (AHA's) to remove impurities and brighten the skin. This is my 'go to' moisturiser if everything else is going wrong! It has no outlandish claims, it just soothes and hydrates even the most sensitive skin. There's a full run down here from my recent morning skincare routine post. This is a really lovely hydrating toner that can be used in your skincare routine or for a quick freshen up during the daytime. It comes in a handy spritz bottle and has a really fine but powerful mist. Dragons blood is sourced from the red sap of the 'sangre de drego' tree and works to form a second skin like protective film on the skin-this helps to protect the skin against environmental damage whilst soothing stressed skin. There is also rose water and vitamin B3. I really love this range from Rodial. A brilliant gel to oil cleanser for cleansing in the evening. I have a review here in my recent evening skincare routine post but this is a firm favourite for my nighttime ritual. I absolutely love the formula, it feels like jelly in the pot without being messy and squishy. The colour is to die for-a pink toned, almost neon coral but without being at all in your face. I prefer to dip a stippling brush in the pot, tap the excess on the back of my hand and lightly buff into the skin. It's easily buildable and the lasting power is incredible. I love the feel of this on the skin even though I know its full of silicon and that's why my skin feels so silky! But it does a fab job at mattifying and blurring the skin before applying foundation. I really enjoyed using it-your skin really does feel like velvet. This is also an oil free primer but Smashbox do a whole range of primers to suit everyone. It's definitely one of their best products and this is my 3rd or 4th tube. This is a deluxe sample size of the toner included in a starter set-it retails for £17 for 150ml usually. I really loved this toner, I love the smell of Aveda products, they're so soothing and spa like. This toner was in the normal/oily skincare set and is designed to hydrate and balance the skin whilst minimising surface oil build up. It contains white oak, witch hazel and peppermint so is mildly astringent. It was the perfect spritz after my exfoliating toner and got me wanting to try more Aveda skincare. I love texturising sprays, I have long, fine, flat hair that gets greasy easily so a texturising spray or dry shampoo does help to give it a bit more ooomph! I've used Batiste for years but the white powder residue is off putting. I find this spray does a bit of everything for me-it has the hold of a hairspray but the oomph and grease absorbing powers of a dry shampoo-and it's clear. And smells amazing. I much prefer this to the Oribe spray and it's a fraction of the price. I loved everything about this candle. The packaging was divine with it's intricate artwork on the outside. When I was recovering from surgery I burnt this every single day in my bedroom. It's beautiful, fresh, clean, light, almost 'sparkly' or sherbert-y and wasn't cloying or heavy at all. It has a 30 hour burn time but I am sure mine was longer than that as I literally used it every day. I would love to try more from Lokum which is a small boutique in Knightsbridge. Their Turkish delight was amazing as well! So that's it, the best of the best, the creme de la creme, the cream of the crop. 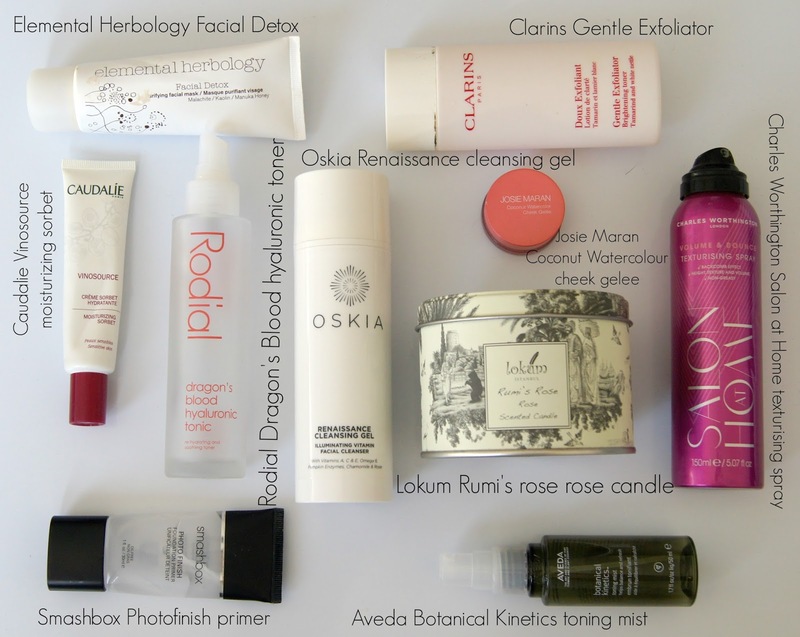 Are any of these your 'must repurchase' favourites?